Breaking Through With Georgiann » Blog Archive » To Infinity…and Beyondananda! Swami Beyondananda, whose favorite yoga pose is tongue-in-cheek, is the spokesperson for a new non-religion, FUNdamentalism (accent on “fun”). 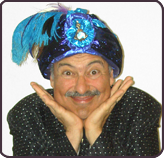 Says the Swami, “We are strictly non-dominational.” The Swami is the alter-ego for Steve Bhaerman, an internationally known author, humorist, and workshop leader. For the past 23 years, he has written and performed as Swami Beyondananda, the “Cosmic Comic.” Swami’s comedy has been called “irreverently uplifting” and has been described both as “comedy disguised as wisdom” and “wisdom disguised as comedy.” Join Georgiann and Steve..er..Swami…for a highly entertaining hour with a strong message. Be part of the conscious evolution…but have FUN doing it!